Make pseudo copies of files, folders, etc. Is there a better alternative to Touvaly Lite? Is Touvaly Lite really the best app in File Management category? Will Touvaly Lite work good on macOS 10.13.4? 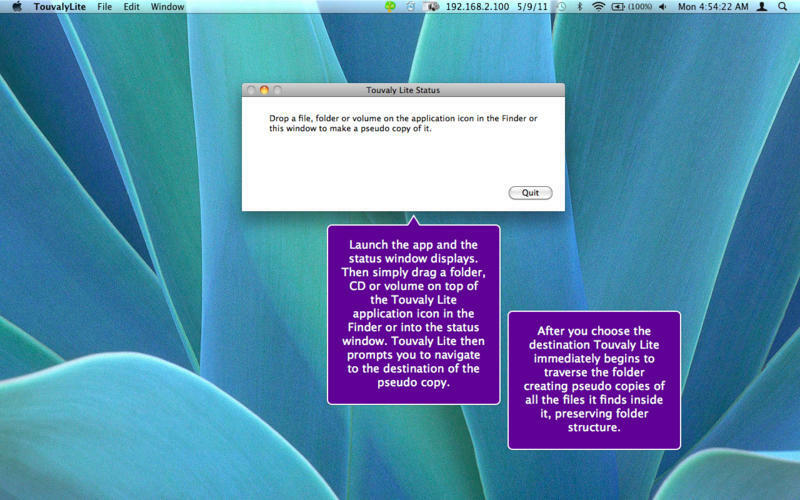 Touvaly Lite is a drop utility for making pseudo copies of files, folders, CD's and volumes. A pseudo copy of a file is a file with all the same attributes as the original file (creation date, modification date, type, creator, name, etc.) but with empty contents. You can use Touvaly Lite to create virtual catalogues of collections of files which use very little space. Touvaly Lite needs a rating. Be the first to rate this app and get the discussion started! Touvaly Lite is a version of the program Touvaly. The difference between the lite version and the full version is that the lite version has no preferences to configure. In other words the lite version runs in the default mode of the full version, except it copies Finder icons by default.